Dimensions (H x W x D): 44" x 43" x 18"
The pre-owned Eagle Under Counter Flammable Cabinet has been used by CleanAir Only. Your files and other important items are safe and secure with the Edsal Flammable Safety Cabinet, SC300F. This practical and highly durable cabinet has a standard two-door manual close design and one 500-pound capacity galvanized shelf that is adjustable on 2.5-inch centers. It also has a double wall 18-gauge welded steel construction with 1.5-inch air space, as well as a 2-inch-high leak-proof door sill to contain spills. In short, this heavy-duty file storage cabinet will protect everything you put inside. The construction meets NFPA Code 30 and OSHA Standard 1910.106 for storage of Class I, II and III liquids and is Factory Mutual approved. This two-door file cabinet has a 30-gallon capacity. 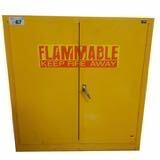 Click the button below to add the Pre-Owned Edsal Flammable Safety Cabinet to your wish list.